Due to the scheduled native brook trout restoration project, four hiking trails will be closed from 8:00PM September 7, 2008 until 8:30 PM September 19, 2008. The four trails impacted are the Middle Prong Trail, Panther Creek Trail, Lynn Camp Prong Trail and the Greenbrier Ridge Trail. Additionally, backcountry campsite number 28 will also be closed. All four trails and the campsite are located along the Middle Prong Little River and its tributaries in the Tremont area. Park biologists plan to treat an 8-mile long section of Lynn Camp Prong with a fish toxin in order to remove the non-native rainbow trout. They plan on re-stocking it with native brook trout captured from other park streams. Once the rainbows are removed, a large cascade downstream from the treatment area will block their return. Funding for the project, which covers the cost of the chemicals and labor, came from a $14,000 donation from Trout Unlimited. Detailed information on trails in the Smoky Mountains; includes trail descriptions, key features, pictures, video, maps, elevation profiles, news, hiking gear store, and more. I received an email today from a gentleman who saw yesterday’s posting on vintage photographs from the Smoky Mountains. The gentleman was kind enough to send a link to his web site which includes photographs from Mount LeConte in a slideshow format. The first slideshow features a couple dozen excellent photos from his hike up to Mount LeConte last year. The second slideshow features a few historical pictures of the LeConte Lodge. They include pictures of the original cabin built in 1925, as well as photographs of the current lodge during its construction phase. There are also a couple pictures of Jack Huff, the original owner of the lodge. Just click the icon in the lower left of the player and then choose either slideshow. Many of the pictures were taken in our national parks. 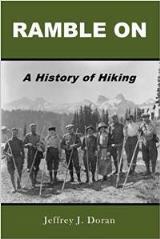 The site includes 154 photos from the Smoky Mountains, most of them taken in the early 1950s, but there are a few from the turn of the (20th) century. Below are a few sample photos from the collection. All four pictures were taken by W.B. Hamilton in the early 1950s. You can view the entire collection of Great Smoky Mountains National Park photos by clicking here. Great Smoky Mountains National Park managers just announced on the Park's web site that Sparks Lane in Cades Cove, will be closed from September 2 through October 8 to allow for replacement of culverts and to improve fish habitat. During the work period the road will be closed to all use including pedestrians and cyclists. Travel around the 11 mile paved Cades Cove Loop Road will not be affected. What if you hiked to the top of Mount LeConte and the outstanding views that you worked hard for included wind turbines on the tops of the mountains and foothills just outside of the park? What if you saw the same thing while atop Gregory Bald, Rocky Top, or Mount Cammerer for that matter? Without a doubt, wind energy is a much cleaner energy source than most other alternatives. Furthermore, smog and pollution are major problems in the Smoky Mountains. But is wind energy truly the best solution, especially in light of the fact that the typical size of a wind tower is 200 to 400 feet in height, with blades more than 75 to 100 feet in length? While driving cross-country on a recent vacation to Colorado, I saw several interesting objects along the horizon as I was passing through Kansas. I checked the odometer on the car to figure out far off they were. After a couple of miles I finally realized that these were turbines from a new wind farm. We continued driving. I measured roughly 20 miles from the first time I noticed the farm on the horizon until we reached the first tower. We then drove for another 10 miles until we passed the last tower of the farm just off the highway. 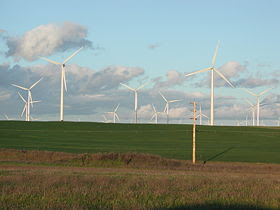 There are many arguments for and against wind power. I’m not writing this post to defend or oppose the merits of this alternative source of energy. My question for all of you is simply this: would you want to see wind turbines while hiking in the Smoky Mountains, or driving along the Blue Ridge Parkway, or even from your own backyard? If we assume that wind power is a viable solution, do the benefits of cleaner and clearer air over the Smoky Mountains out-weigh the degradation of the views from the mountain tops? I simply raise these questions because there is more and more pressure from various sources to develop wind power across the nation, including the region surrounding the Smoky Mountains. If you’ve been following Karl Meltzer’s bid to break the Appalachian Trail speed record then you may have heard that he ran into a little trouble that has put his record quest in serious jeopardy. In fact, based on his last blog entry, he has more or less conceded that he won’t be breaking the record this go around. Problems began for the ultra marathon runner early on when he was forced to trek through several days of rain in Maine that resulted in a nasty case of trench foot. He also contracted poison ivy on the toes on his left foot, forcing him to over-compensate on the other foot which resulted in tendonitis. All of this has forced him off the trail for at least three days in-a-row now. In his last blog entry he vowed to continue on for the learning experience, and suggested that he will try for the record again in the future. Bored, looking for something to do? Looking for a new adventure? You could sign-up for the 2009 Polar Challenge Race. It’s simple. All you need is $45,000 dollars and two other friends with the same amount to pay the entry fee. But wait, don't let the price tag scare you just yet. The fee does include all of your travel expenses as well as an intense training program to survive the race. You don’t even need any experience to participate! The Polar Challenge is a 320-mile cross-country skiing race to the Magnetic North Pole. It commemorates American adventurers Robert Peary and Matthew Henson on their successful first visit to the North Pole. The winning three-person team is awarded the Peary & Henson Cup. Don’t have two friends with that kind of money to blow? You could still sign up and find, or be assigned to a team in need of another person. Maybe you don't have that kind of money to blow. You could always find a few sponsors willing to help foot the tab in exchange for a little logo space. To prepare for the extreme Arctic weather, where temperatures can drop to -30 degrees, and wind chills can plunge to more than -85 degrees, the event organizers will take you through an intense series of training. In the weeks and months leading up to the race you’ll be trained by experts in skills such as: proper use of all expedition equipment, navigation, skiing, weapons training to defend yourself from polar bears, ice break drills, and, of course, Arctic survival skills. Training takes place in the United Kingdom, Norway and Canada. The first training event begins next month for the April, 2009 race. For me, I’ll be sticking with something slightly less extreme, like a hike up Mount LeConte. As reported in a previous blog of mine, 25-year-old Jennifer Pharr Davis was close to smashing the women’s speed record on the Appalachian Trail. Confirmation of the new record was reported today on BlueRidgeNow.com. Davis completed the entire length of the Appalachian Trail when she sprinted across the finish line at Springer Mountain on Saturday afternoon. It took her just 58 days to complete the 2176-mile trail. The previous women’s record was 87 days, set by Jenny Jardine in 1993, which was an unsupported hike. Davis received support from her husband along the way. Davis wrapped up the record in style. She hiked 300 miles during the final week of her journey, including a whopping 64.8 mile trek on her second to last day on the trail! “It’s the longest-known day of any of the record holders,” she was quoted as saying in the article. Davis also said that “there are only four men that have hiked it faster” than her now. She may have to bump that number up to five soon if Karl Meltzer has any say so. On August 5, Meltzer set-off to break the overall fastest record of 47 days. Completing the Appalachian Trail is a major feat in and of itself, but doing it the way Ms. Davis did is truly remarkable. Preliminary results from the necropsy of the bear that attacked the boy in the Smoky Mountains last week were released yesterday. Although preliminary, the results confirmed that the bear that attacked the eight-year-old Florida boy did not have rabies. Additionally, park officials said that neither the boy, nor his family, did anything to provoke the attack. None of the family members were carrying any food with them, however, the father said that they had fried chicken about an hour before the attack and the smell of the meal may have been in their clothes. Officials believe the attack was predatory, with the bear targeting the smallest member of the family. One park official said that the bear "stalked the boy as prey". Park officials are also 100% sure now that they’ve killed the right bear. Proof of this was confirmed when parts of a tennis shoe were found in the stomach of the 86-pound bear. The shoe matched the one that the boy's father lost while fighting the bear off of his son. Interestingly, the author of “Your Smokies” blog reported that another bear acted aggressively towards him as he was returning from his hike on the Lead Cove Trail in Cades Cove. This happened just one day after the attack on the Florida boy. The question or suggestion has been floated on a couple of forums and blogs, so I’ll ask it here again: is the extreme drought in the Smokies causing food shortages for bears which is resulting in them acting more aggressively? If this is the case, visitors to the Smokies, especially hikers and campers, should take special precaution while in the area. To put this in perspective, however, this was only the eighth bear attack in the Smoky Mountains in the last 10 years. Only one of those attacks resulted in a fatality. With roughly 1,600 black bears in the park and more than 9 million visitors each year, your chances of being attacked are extremely slim. Today, HikingintheSmokys.com officially announced the launch of our new online hiking gear store. The new store is specifically dedicated to day hikers and offers quality gear and apparel from some of the best outdoor brands, including; Columbia Sportswear, Kelty, Garmin, Leki, Marmot, Mountain Hardwear and North Face. The store also sells books and DVDs for hikers and visitors of the Smoky Mountains. The store is unique because it focuses on the needs of the day hiker. Our goal is to make it easier for hikers to find the gear and apparel they need for day hiking without having to sort through backpacking, camping and other outdoor gear. Furthermore, online shoppers also enjoy the convenience of shopping from home or work. You can visit our new store at: www.hikinginthesmokys.com/store.htm. If you get a chance to check out the new store, let us know what you think. We would appreciate any feedback or suggestions on anything we can do to improve your shopping experience. If all goes as planned this weekend, 25-year-old Jennifer Pharr Davis will set the women’s record for the fastest assisted thru-hike of the Appalachian Trail. If she reaches Springer Mountain in Georgia by today she will have completed the entire Appalachian Trail in just 58 days. Her initial goal was to complete the trail in 60 to 80 days. Currently, Jenny Jardine holds the women’s AT speed record, setting-it in 1993 when she and her husband hiked the trail in 87 days. There’s one key difference between the two treks though: Jardine hiked the trail unsupported, whereas Davis is hiking the trail with support from her husband, whom she married just days before launching her quest. Jennifer’s husband supplies her with food and water at road crossings and takes her camping gear to the next overnight spot. She only carries food and water in a waist-pack and doesn’t carry a backpack. Davis began her southbound hike on June 20 at Mt. Katahdin in Maine. Once completed, she will have covered the 2,176 miles on the world-famous path for the second time. For most thru-hikers, this trek usually takes five to six months. This is no fluke for Davis. She holds records for the fastest unsupported hikes on the 270-mile Long Trail in Vermont and the 660-mile Bibbulman Track in Australia. She has also completed the Appalachian Trail in 2005 and the 2650-mile Pacific Crest Trail in 2006. Each day, Davis covers almost 37 miles during 13 hours of hiking, while burning an incredible 4,000 calories. She estimates that she’s run about 30 percent of the miles along the way. She’s also gone through 10 pairs of shoes so far. Davis has undertaken this personal challenge, in part, to honor victims who have been murdered while hiking within the last year. She is honoring Meredith Emerson who was killed while hiking on Blood Mountain in Georgia this past January, and John and Irene Bryant, an elderly couple who were murdered in October while hiking in Pisgah National Forest. She hopes her record hike will assure others that, despite these isolated tragedies, they shouldn’t fear the woods. BlueRidgeNow.com is also covering her trek. Most people familiar with the Smoky Mountains already know that the park has a very diverse ecosystem. However, the All Taxa Biodiversity Inventory (ATBI) study is proving that the Smokies are far more diverse than anyone ever thought. As widely reported last month, the ATBI has already identified 16,570 species in the Smokies, including 6,129 species new to the park and 890 that are new to science. The web site for Discover Life in America (DLIA), the non-profit organization coordinating the ATBI, reports that the study has already discovered 36 new species of lepidoptera (moths and butterflies), 23 species of hymenoptera (bees, wasps, ants, etc. ), 57 fungi, 270 bacteria and 11 viruses – all new to science. Additionally, the inventory has discovered seven birds previously unknown in the park. The only mammal to be documented as new to the park was the Evening Bat, which was first recorded in the park near Parson's Branch during the summer of 1999. As I was perusing the web site my curiosity led me to see if the ATBI has found any evidence of mountain lions. Despite a few recent unconfirmed reports, the study has yet to find any evidence of the big cat in the Smokies. Sightings of bald eagles have been well documented in the Smokies. In fact, they’ve been known to nest in the region. What surprised me, however, was the report of a few rare sightings of golden eagles in Cades Cove and along the AT. Although the study is still in progress, it’s estimated that the ecosystem harbors as many as 100,000 different species. Over the last ten years more than 1,000 scientists and students have been involved with the study. An additional 50,000 hours of volunteer time has been logged to help with the project as well. The success of the project has created a bit of a problem for the ATBI. Additionally, there are an increasing number of national parks that are launching their own all-species inventories that’s resulting in a global shortage of taxonomists. The ATBI in the Smokies is trying to lure hard-to-get taxonomists with mini-grants as well as using the allure of being involved in the world’s premier species inventory. With the study expected to take another 5 years, and with data and specimen analysis lasting many years thereafter, the ATBI will have to hope that scientists will consider the Smoky Mountains as the most prestigious option for pursuing their profession. I just wanted to give an update with regards to a couple of follow-up details on the bear attack that occurred near Gatlinburg on Monday evening. As was widely reported yesterday, an eight-year-old Florida boy was attacked by a bear near the trailhead of the Rainbow Falls Trail in Great Smoky Mountains National Park. The boy required 35 stitches and staples for wounds to his arms, torso and the back of his head. I read some speculation on a popular forum that there was a possibility that the boy somehow provoked the bear. This doesn't seem to be the case. Based on reports from the boy and his father it sounds like the attack was completely unprovoked. The family was simply taking photos by the creek near the trailhead when the bear appeared from behind a tree, as reported by the young boy. The bear actually attacked the boy twice. Both times the boy's father and his 10-year-old brother had to fight it off with sticks and rocks. The bear was originally reported as a young cub weighing 55 pounds. Today's Orlando Sentinel article reports the bear as being a young male weighing in at 86 pounds, making him a yearling. Within minutes of the attack forest rangers were on the scene. They found a bear in the vicinity that acted aggressively and shot it. Although they're fairly certain that this was the same bear that attacked the boy, they won't know for sure until a necropsy is performed. The linked article also includes a short video interview with the boy, his father and his brother. Okay, I know this post has nothing to do with the Great Smoky Mountains, but it's still hiking related. I thought I would share a few photos from a couple of hikes we did on our recent trip to Colorado. While in the Rocky Mountain State we hiked Huron Peak, Gilpin Lake, the Devil's Causeway and Rabbit Ears Peak. Gilpin Lake in the Mount Zirkel Wilderness Area. The Devil's Causeway in the Flat Tops Wilderness Area. This is a land bridge at an altitude of roughly 11,800 feet. The bridge is roughly 100 feet long and narrows to just 6 feet in width. On either side of the bridge are 1000 foot drop-offs! Unfortunately (or fortunately), I didn't get a chance to walk all the way across. Just seconds after shooting this picture it began to rain and we were forced to turn around. We had to hightail it down the mountain after we began hearing thunder. Columbine on the trail to Rabbit Ears Peak (just outside of Steamboat Springs). A marmot hamming-it-up for the camera. From the summit of 14,003-foot Huron Peak in the Wasatch Range. I’ve been meaning to ask this question for some time. I was hoping someone might have an answer for me. I was up on Gregory Bald last month when I heard a loud pounding. Actually it sounded like someone was hammering on aluminum siding. I heard this noise just as we emerged from the woods coming up from the Gregory Ridge Trail. The sound came from the left side of the trail, which would be due south, and it sounded like it was 75 to 100 yards away. I figured once I was out in the open I would be able to see where the commotion was coming from, but I didn’t see anything, nor did I see any trails heading in that direction. My next thought was that the sound was coming from a backcountry shelter. However, according to the map, the shelter was about a half mile from where I was and in a different direction (due west) from where the sound was coming from. Does anyone have any possible suggestions on what this may have been? Well, according to some statistics, the answer is yes. Several statistics showing declining visitation for the Park system as a whole since peaking in 1987. Not only are people visiting less often, but they’re also visiting for a shorter amount of time and they’re camping less. Furthermore, Americans are spending less time on outdoor related activities in general. Although many explanations have been put forth, such as increased time watching TV, playing video games or surfing the internet, the article states that the biggest reason Americans aren’t visiting our National Parks is because they’re flocking to big cities for their vacations now. Instead of Yellowstone or Yosemite, families are now opting to visit New York or Las Vegas. Fortunately, or unfortunately, depending on your point of view, visitation in the Smoky Mountains has held steady over the last 8 years. Yes, the Park had more than 10 million visitors in 1999 and 2000, but if you look at the long-term picture (see graph below - visitation statistics are from 1959 through 2007), visitation in the Smokies has slowly trended upwards. Looking at the National Park System as a whole, should falling interest in our National Parks be cause for alarm for those of us that love them? The thinking goes that if we as a nation no longer support the Parks, we may no longer want to pay for them. Maybe Ken Burns’ new documentary series will spark a renewed love affair with our Parks. Are you at all concerned about these trends? Is there anything that we as a nation should do?